Here is a sports car with illuminated taillights are you interested? 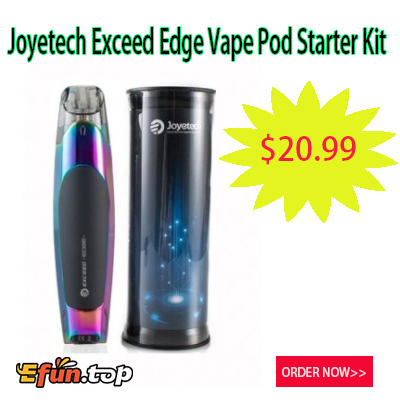 Joyetech Exceed Edge Kit is the first vape pod starter kit by Joyetech, inspired by design of sports car with illuminated taillights. With smooth appearance and pocket size, Exceed Edge Kit integrates a coil changeable pod system with large 2ml e juice capacity to bring you great vaping experience. Exceed Edge Pod Kit supports both flavor chasing and high nicotine (salts) to satisfy variety vapers. There is an ergonomic big fire button for easy operation. To own it making your vaping wonderful! Let's bring this unique design home!